I’ve always been a busy kind of person. During college, I worked 20 hours a week in addition to my academic and extracurricular activities, and did absurd things like commit myself to doing 90 days straight of Bikram Yoga at 6 in the morning. After college, I taught full time while also taking 3 grad school classes each semester and working at a retail store on the side. I only recently realized how different the words “busy” and “productive” are, and learning to use OmniFocus properly was what pushed me towards being productive rather than busy. 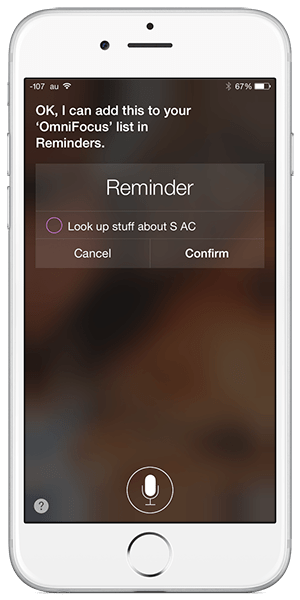 Let OmniFocus be your personal assistant. Capture everything! My phone is almost always with me. As soon as I remember about something I need to get at the store, someone I need to call, a random thought, etc. – I get it out of my brain and into OmniFocus. If I’m on my mac, there’s a shortcut to pull up a Quick Entry box, but if I’m out and about I just tell Siri to add stuff to my Inbox. Sometimes I can’t or don’t feel like pulling out my phone so I write ideas down in a notebook and transfer them into my Inbox at the end of the day. Keep things moving. Every evening I take 15 or so minutes to clear out my inbox by assigning projects, contexts, defer/due dates, and repeats as necessary. Every Sunday I take a little bit more time to review my projects and make sure everything is in order. Every morning I plan out my day by flagging several “big” (important) tasks and some smaller items that fit with my day. Trust the system. As long as I capture everything right away and maintain my OmniFocus routine, I can confidently begin each day with a manageable To Do list, get everything done that I need to, and still have time for meaningful personal projects. Apply the 80-20 rule to your daily tasks. Don’t fall into the Amazon trap. What is the Amazon trap, you ask? That’s when you need to order a new Brita filter and spend an hour reading reviews on Amazon because it’s so important that you order exactly the perfect filter. Think about the diminishing returns on your time, and aim to spend more (80%) of your time and energy on what matters and less (20%) on the Brita filters in your life. To help me with this, I order my tasks by importance and amount of time/energy to complete. I use the contexts @!, @! !, and @!!! to help me prioritize and not fall into the Amazon trap. @! : Tasks that will take a relatively short amount of time or minimal energy. @!!! : Tasks that will take a significant amount of time or that will require quite a bit of focus/concentration. @!! : The in-betweens. I usually can identify what really should go into @! and @!! !, and then everything else goes into @!!. This is how I order my contexts. Then, when looking at my custom context-grouped perspective called “Today,” tasks are more or less ordered by importance. The @AM perspective contains my morning routine and things I always do in the morning. Then come the main tasks for the day. At the end of the list I will have any @Errands to do that day, things I do at the end of the day @Home, and lastly items I can’t act on right now because I’m @Waiting on someone/something. I try to just go straight down the list in that order because while everything on there is important and needs to get done, it’s such a load off my back when I’ve completed a major project or difficult task before lunch. Plus, I might actually have less time in the evening and be forced to spend less time obsessing over the small stuff. Have you ever had one of those days where you say to yourself “Okay, I’m just going to do these easy things really quickly and then I can concentrate on this super important project for the rest of the day!”? What actually ends up happening is you spend too much time on those easy things and don’t get around to the important project. OmniFocus helps me capture, plan, organize, and prioritize, but it’s out of the way when I need to actually get going on my To Do list. Things like contexts and perspectives help me know what’s important and relevant at the time so that I can use resources most efficiently. Custom Perspectives: “Plan” and “Today” are two perspectives I rely on to keep my system going. 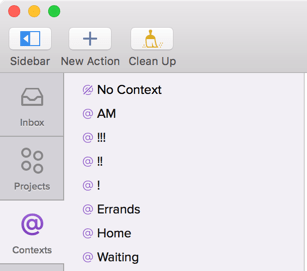 When I open up OmniFocus in the morning I go straight to the Plan perspective, which shows me all items I could do that day. As I go down the list I will flag items I’d like to complete. This list is kind of long, but not too long because deferred items don’t show up. For example, I’d like to send my sister a birthday card, but I don’t want to send it too early. I’ve deferred that item until about 1 week before her birthday, at which time it will populate in my Plan perspective. It’s actually kind of fun looking at this perspective in the morning and strategizing your day. I make sure to select only a few @!!! items so as to not overload myself, and then based on those items I can select the smaller tasks. I might notice that a couple of the errands on my list are near where my afternoon meeting is, so to maximize my time I will flag those for completion. After I finish flagging items in my Plan perspective, I open up my Today Perspective. This is my To Do list for the day. It shows all due or flagged items, ordered roughly in the order that I will complete them due to the way I’ve set up my contexts. At this point, I know what I need to do so it’s just up to me to do it. I can close out any editing or planning windows or panes and enjoy the feeling of satisfaction as I check things off. 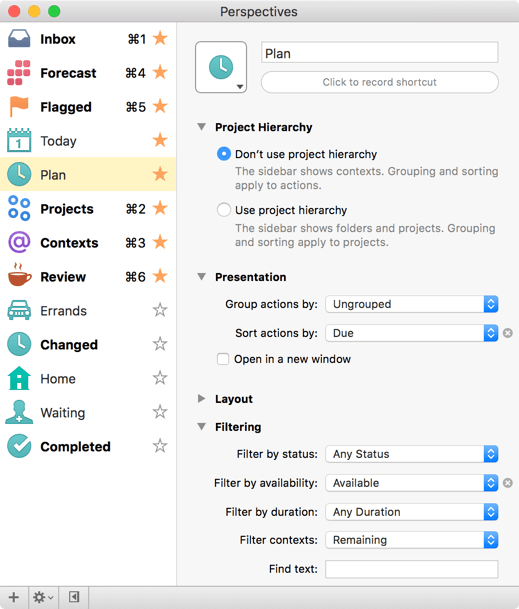 I’m always tinkering with my workflow as my circumstances and priorities change, and OmniFocus is able to keep up with my whims while consistently remaining vitally useful to my productivity. Polina Burkart blogs elsewhere and has a strange love for everything dealing with organizing, planning, arranging, and making sure things are just so. She graduated in 2012 with a BA in Psych, taught for a bit in the DC area, and now finds herself in Japan.